Williams, Belasco, and Meyers (1930-1932), which published the New Classics Library (1930). The Illustrated Editions Company (1929-1942), publishing the Illustrated Editions series. These books were also sold between 1930 and 1942 at Macy’s for .65 cents under the Macy Classics name (Publishers Weekly, Vol. 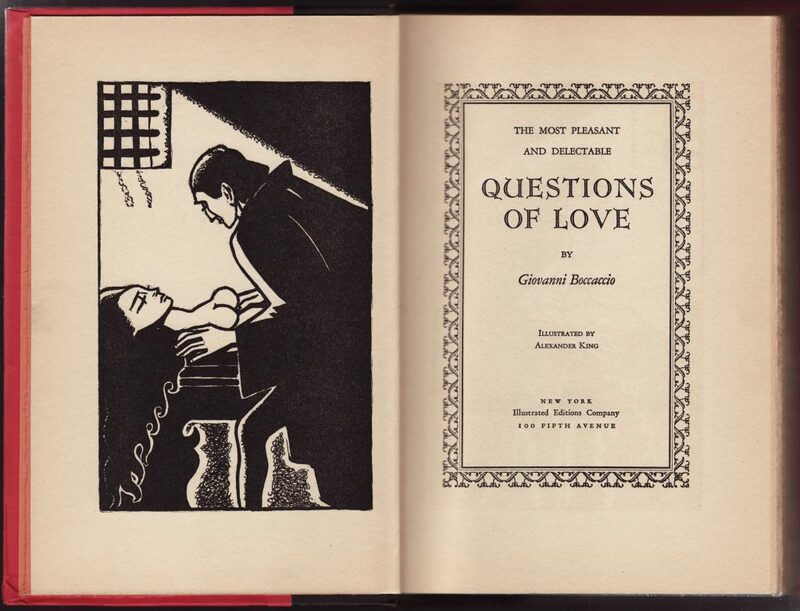 122, 1933), as the Arden Library by Concord Books (The Concord Bookstore) from 1933-1937), and as the Cameo Classics (distributed by Grosset and Dunlap) from 1935-1948. Three Sirens Press (1930-1946), which published the Three Sirens Classics between 1930-1940. Three Sirens Press also appears as the imprint for Macy Classics titles in some cases. Joseph Meyers was described by Bennet Cerf (Modern Library, Random House) as a “notorious pirate” in Gertzman’s book Bootleggers and Smuthounds, and the trio of presses allegedly indulged in reprinting numerous books without holding the copyright to those titles. By not paying copyright fees, Meyers and Williams were able to print and sell good quality illustrated books at prices that were below typical smaller, unillustrated reprint series of the 1930s. In 1940 Meyers and Williams were selected by the American News Company to head up the new company specializing in paperback books. Using ANC’s money, Meyers purchased J.S. Ogilvie Publications, a pulp fiction magazine company, renamed it Avon Publications, and began issuing a line of paperbacks, Avon Books, as well as comics. Avon Books, along with Penguin and Pocket Books, were the leaders of the late 1930s paperback revolution that would eventually out-compete hardcover reprint series. Meyers and Williams various illustrated classics publications ceased around this time (1942). Avon continues today, primarily as a publisher of romance novels. Illustrated Editions titles were slightly rebranded and sold by World Publishing Co. from 1942 through the mid-1940s as the Illustrated Gift Editions, and under the Hartsdale House name from 1946 through 1960. Titles in the Illustrated Editions series were quite nice for their .69 cent price, compared to series such as the Modern Library, about half the size with no illustrations and thin paper at .95 cents. The sale of such titillating titles at mainstream department stores such as Macy’s is a curious phenomenon of the 1930s. 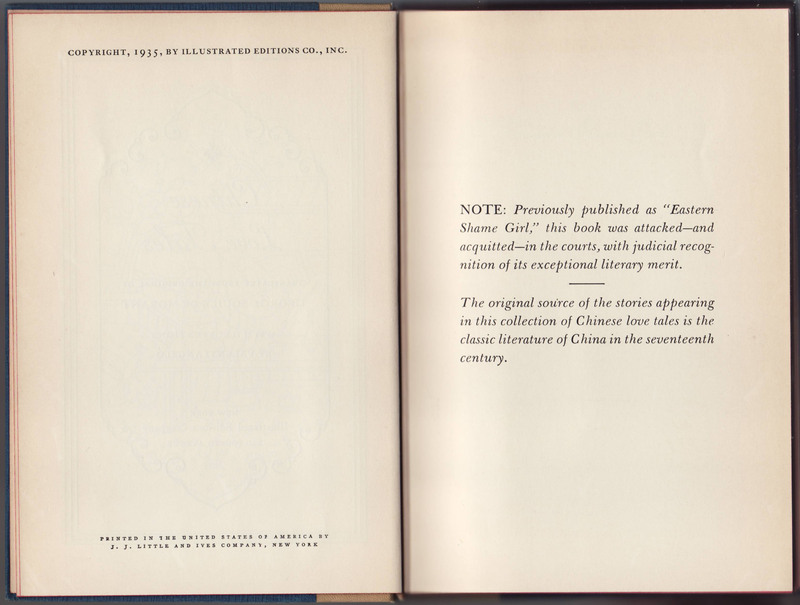 The series is lauded in a pair of paragraphs on the back of the jacket, and the first fifteen titles are listed, along with illustrators. 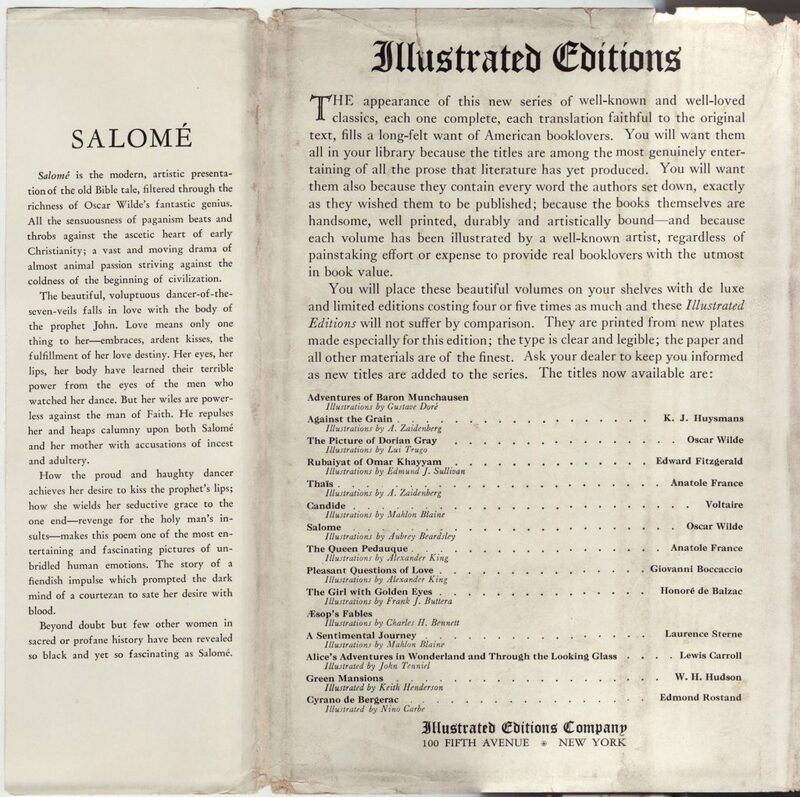 The series edition of Salome is advertised on the rear jacket flap. Bindings are quarter-bound, black and gold with red cloth. The edges of the cover are beveled, something I have not seen in any other series (but not uncommon with “limited edition” illustrated book series. The books, somewhat oddly, don’t include a half-title page, typically included on even the cheapest of reprint series. An illustration from the book, with a couple of curiously orbicular breasts, faces the title page. The copyright page indicates that the book is based on a 1566 translation by H.G. Put “put into modern English” with an introduction by Thomas Bell. This same edition was published by the Three Sirens Press (also run by Williams and Meyers, available in the 1930s), the World Publishing Co. (from 1942-1946, as the Illustrated Gift Editions), and Hartsdale House (1946 -1960). The printer of this book is J.J. Little and Ives Co., of New York. 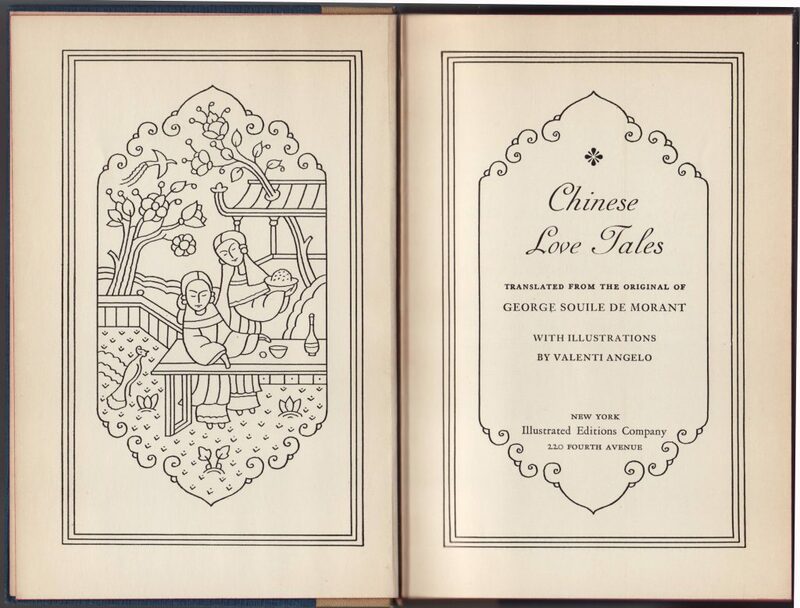 This edition of Chinese Love Tales is illustrated by Valenti Angelo and has a copyright of 1935 and was published sometime in the 1935-1942 date range. This particular title was translated by George de Morant. An earlier version, illustrated by Marcel Avond, was published as Confessions of an Eastern Shame Girl (1920, Valhalla Press, Paris) and “privately printed” in the US as Eastern Shame Girl (1929). The latter ran into some trouble with censors. Meyers and Willams seem to have had the book re-illustrated by Valenti Angelo (no other Angelo-illustrated version shows up earlier) with a copyright date of 1935 published under both the Personal Books Inc. and Illustrated Editions Inc. names. A copy was also published under Meyers and Williams Three Sirens Press imprint (in a slipcase). The Personal Books version maintains the Eastern Shame Girl name, while the Illustrated Editions and Three Sirens version is titled Chinese Love Tales. 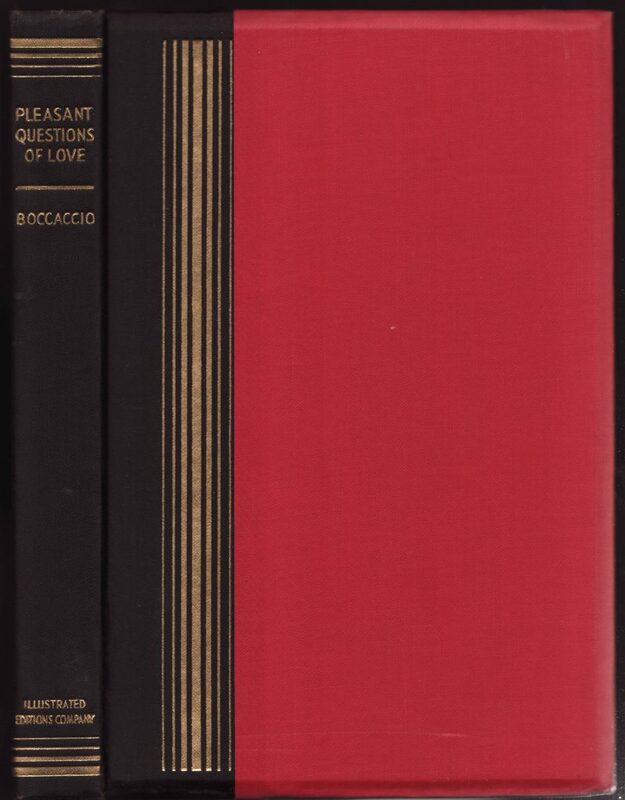 The size too has been scaled down: for the Illustrated Editions version, down to 5.5″ x 8.25″ from the 6.5″ x 9.5″ size of the Boccaccio (above) and even smaller, at 5″ x 7.5″. The Personal Books version also has cheaper paper and binding. 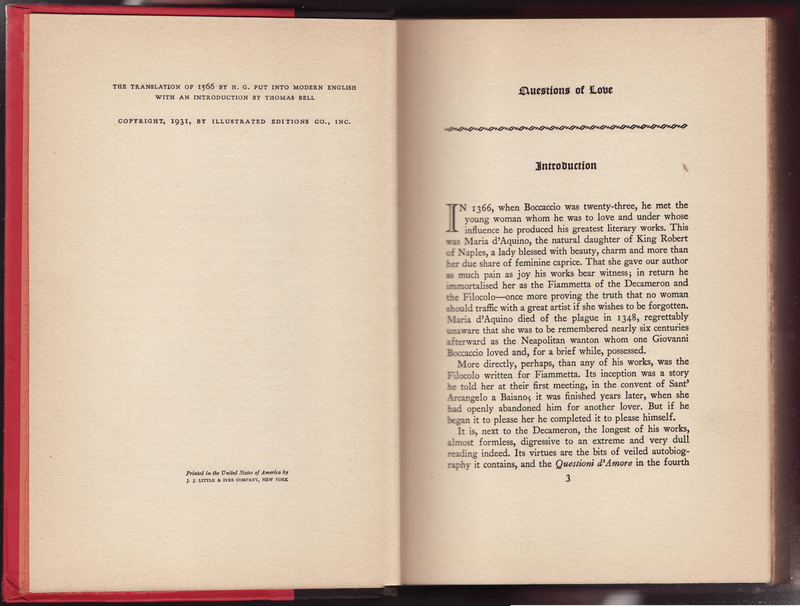 It is not clear if all the Illustrated Editions titles were scaled down at this point, although Hartsdale House, which published the plates from Illustrated Editions, Inc. in the 1940s after that firm folded, published many of the Illustrated Editions titles in the late 1940s at both the larger and smaller sizes (suggesting there were at least two sets of plates). It is possible that Williams and Meyers printed different versions for sale in different venues (in particular, department stores). 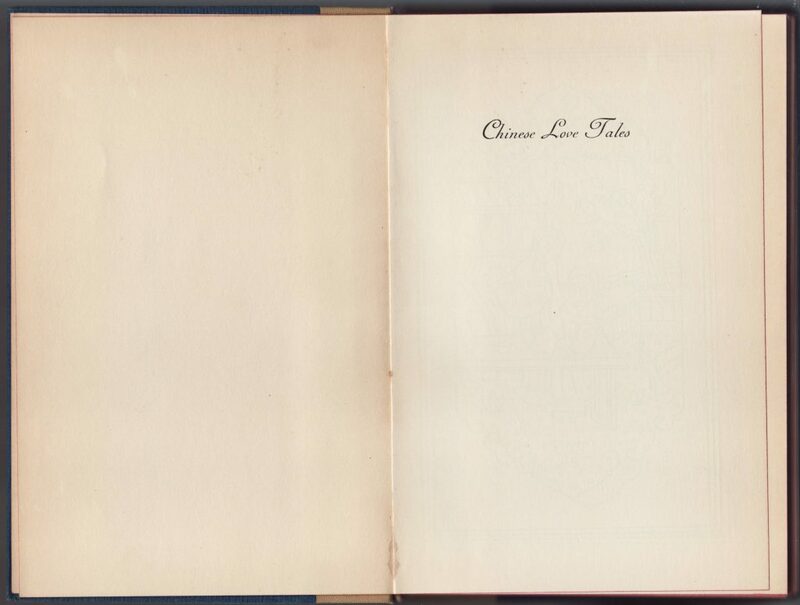 The entire jacket of Chinese Love Tales is below. The spine includes “An Illustrated Edition” and the rear of the jacket lists 21 titles (compared to 15 on the Boccaccio above). 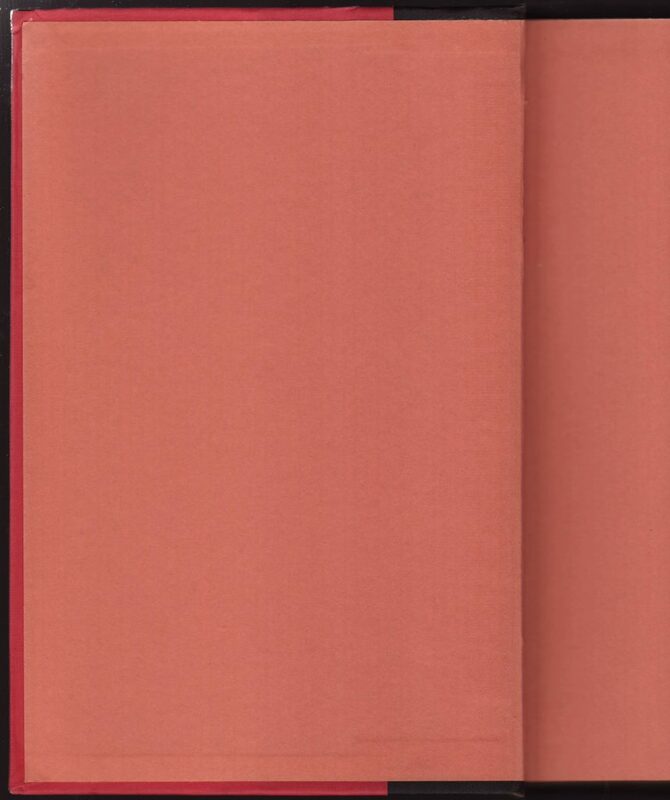 The bindings have changed to a quarter binding in a textured faux patterned leather. 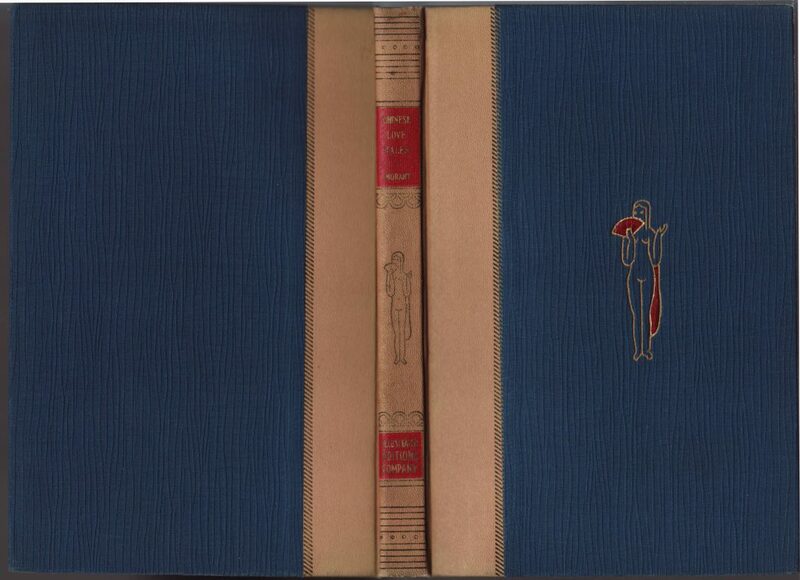 The spine and adjacent binding are tan with gold and red typography and decorations, and the main section of the front and rear cover are in blue material. 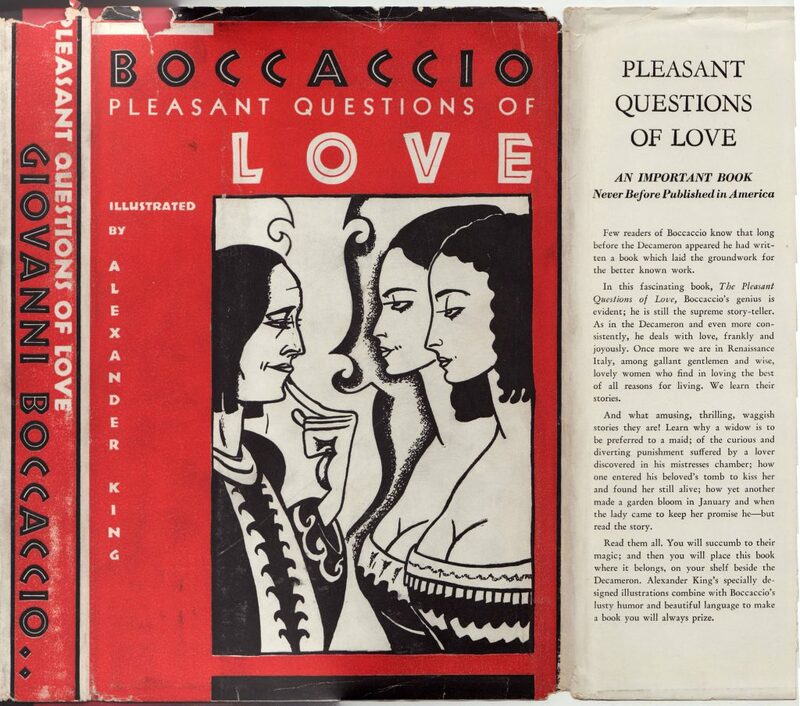 A saucy illustration in two colors is printed on the front cover of the book. The title page, with an illustrated frontispiece facing the decorated title page. The copyright page indicates 1935. The printer is, as with the earlier, larger copy above, J.J. Little and Ives Co., of New York.